A recent report from MarketingSherpa shed some light on why people unsubscribe from emails. In this article we’ll discuss the top three reasons and incorporate personal experiences as examples. In a follow up article we’ll suggest a solution to eliminate these problems. First, 53% of respondents unsubscribed from emails when content did not interest them. This reminds me of a personal situation I recently experienced. An email landed in my inbox inviting me to learn more about security firewalls. I’ve never expressed interest in these types of solutions nor have I ever researched them. I hit the unsubscribe button. Second, staying on an email list results in more unsolicited spam. I’ll share another personal example. Although I can’t recall how, I must have signed up for a sales and marketing newsletter at some point. Time passed, I forgot who I signed up with. I’m convinced my information got passed out to a 3rd party who is now licensing it to others. Now, I get about 3-5 emails per week from list vendors trying to sell me contacts. It’s frustrating too; they don’t have a link for me to unsubscribe. I hit the spam button. 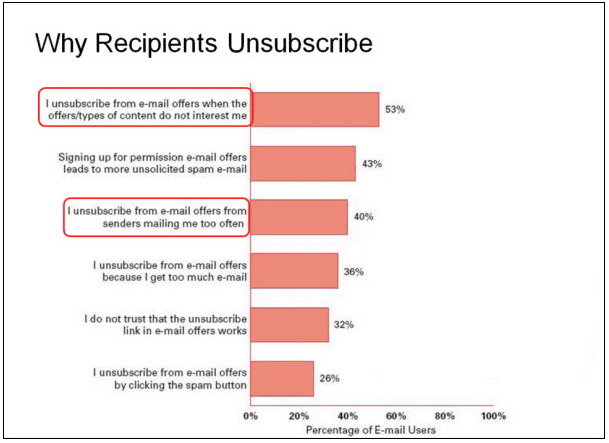 Third, people unsubscribe when they receive emails too often. Sure enough, I’ve got an example to use for this reason as well. The example also relates to the first point, sending irrelevant content. My wife and I were considering the purchase of a new car, an Acadia Denali to be exact. About one month back we decided to request a quote through a GMC dealership online. We got an email quote from the online manager moments later. A few days later the online manager called me up. I took about 15 minutes to explain our situation. We let him know we had a few cars we need to trade in first before we’re able to buy. The online manager committed to look into buying our cars. Everything was going great, at least it seemed that way. 5 days later we decided to go into the dealership to test drive the car for the first time. We were upfront with them and told them about our experience online and that we made contact with the online manager. Here’s the kicker. For the next three weeks following our in-person visit I received emails saying things like “what do we have to do to earn your business?” and another email offering me an opportunity to buy a bunch of other cars before they go to auction. My reply to that is “I already told you, I need to sell my cars and no, I’m only interested in the Acadia Denali”. It seems the dealership didn’t listen to my interests and failed to respond in relevant ways based on my interaction. Their communication was irrelevant and too frequent during this follow up period. I’ve since unsubscribed. Why do you think people unsubscribe from emails?